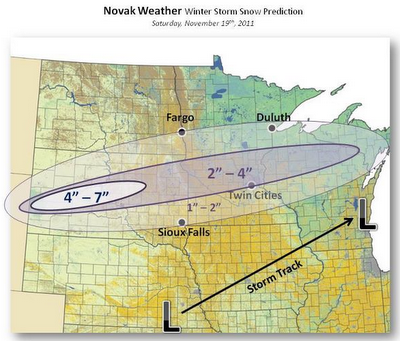 As of Friday night, most forecasters were predicting a minimal snowfall for the Twin Cities of 1 to 2 inches. The Weather Channel predicts 2-4 inches. The following are forecasts from most of the major outlets. Note there are some differences among forecasters as to where the region's largest snowfall will occur. 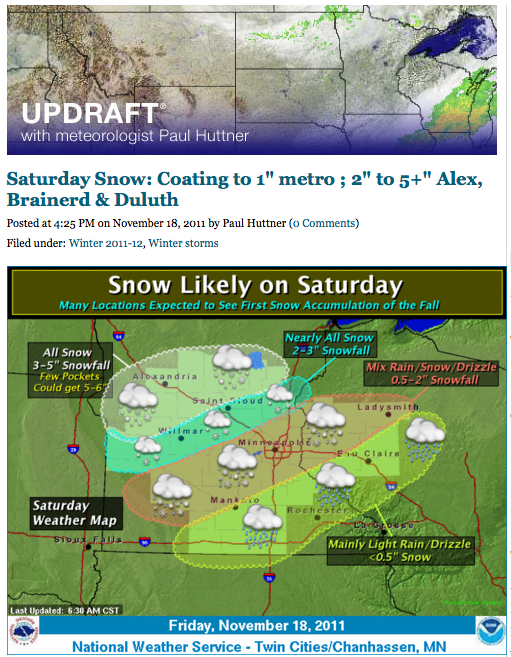 For new visitors, Minnesota Forecaster can be found on Facebook and Twitter. Anybody know the time frame for our air to saturate enough for snow to fall? The weather.com future cast (which I know isn't very reliable) shows all moisture drying out and shifting NW, basically around the southern MN drought "bubble" through at least 3:00 am. Is this still going to be a PM event or should we expect snow in the AM too? I would expect the air to saturate around sunrise tomorrow. 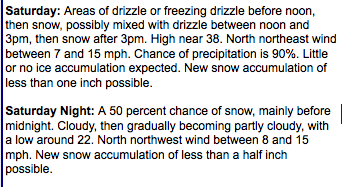 The snow will fall at a decent clip between 10am - 3pm. 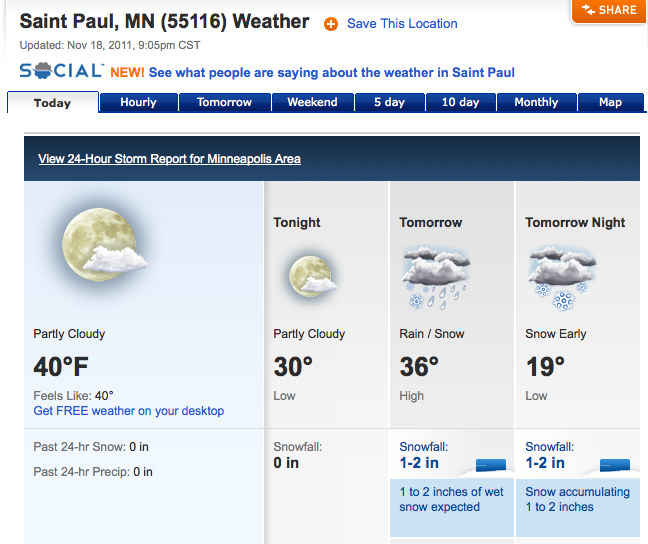 There is no doubt that the northern MSP metro has potential for 3" to 4" of snow by sunset. It should be a "pretty" snowfall that creates a blanket. Amounts should taper as you head south of the downtowns and north of St. Cloud. 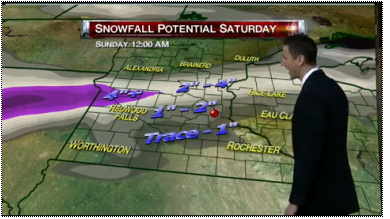 Rochester and Fargo will be lucky to see any accumulating snowfall at all. 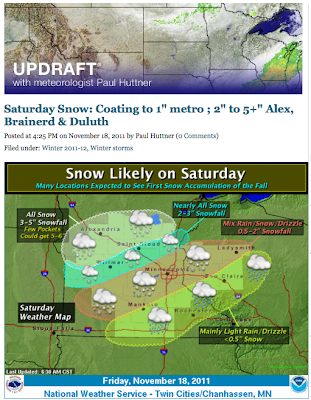 I'm a little surprise that the MSP NWS has not issued an advisory for the northern MSP metro for tomorrow. Perhaps they will overnight. Bill I love the snap shots of all weather maps/snowfall projections,condensed onto one page(you should do that for all winter storms this winter),as for todays event radar returns at this hour north of metro and drying up as well,but main precip in south dakota looks like could be going further south(noticed NWS mention it in thier morning discussion as well)I believe the metro will end up with more snow then some thought,like the ones who said an coating to 2",I could see 2.5 to 3.5,considering that it will be an all snow event with any mixed precip south of the metro,we'll see how this will all shake out in a few hours,but winter/snow lovers dont look too far away cuz you will be disappointed the snow wont last long and temps will flirt with 50 on thanksgiving and black friday,real cold stuff will hold off till December(this will not be like last November)but its a start,right??? The slightly higher snow forecasts this morning seem optimistic to me with the direction the snow has set up overnight: through Morris and Little Falls, with just a little movement toward east and south. Even if we do get more than an inch, don't expect snow in the immediate metro until the lunch hour; it's staying the course right now. BTW hey Bemaki,go check out accuweather or as Bill likes to say inaccurateweather,that 3 day snowstorm at the end of the month is now gone,replaced with partly sunny and cloudy days with highs ranging from 35-41,just as I suspected when I said the storm will disappear and be replaced with partly sunny skies and highs 37-42,why do they even bother with a 15 day forecast,its not accurate within 7 days! I knew it was wacky... it always is! boy did I blow this one!!! went with a trace in the se metro to around a inch in nw. I went with the SREF model on Friday but I also noticed that by Thursday 6 of the 11 members that make up the GFS ensemble mean were showing 3-4" if not more for the metro...choose to discount that solution...my bad!!! lol. Started snowing here at 12:30 already have a coating on some hard surface's. About a half inch and snowing pretty darn hard up here in east bethel. Small flakes, but looks nice and was fun for the kiddo while we put up Xmas lights. It won't stick around, but it's a start! wow 11.5" has been recorded by a co-op observer near Hinckley MN. Looking at the radar returns of 35dbz or there about for a length of time I can believe it!!! I can't tell how much we have out here in Carver County. A good inch, at least, but we're so flat and open that it's all just blowing around. The parking lots and roads are rather bare, but there are 1+ foot drifts along the curbs. Solid 2.5 inches in St. Paul. St. Stephen is also recording over 11 inches of snow...and they're still only in an advisory. Nobody was prepared for that much snow today. lot's of busted forecast's out there, no one in their wildest dreams saw a foot of snow anywhere!!! This is going to be a tough storm to grade. 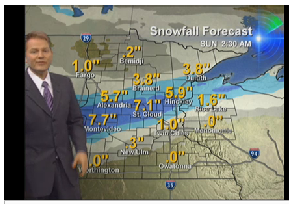 On the one hand, WCCO and KSTP recognized the chance for greater snow amounts just north of St. Cloud, but on the other hand, nobody predicted the second area of moderate snow that consumed the southeast metro and gave them 2-4" totals while keeping totals lower in the north metro, where they actually expected 2-4". Not a fun storm to forecast. Rumor has it another small system may develop next weekend. Nobody's saying much about it yet, but NWS is already calling for a chance of snow while "un"-Accuweather is calling for rain. AB...I was also shifting my attention to that potential storm system...doesn't look like much on the models to me, but NWS already has a chance of snow/rain in the forecast. Can't wait for the next storm, they can't come far enough apart! On a note about today's storm, RW ended up with a good 1 inch I could say, more than what they thought, maybe even pushing 1 1/2 inch in a few spots around here. Pretty healthy for what was forecasted. now my attention changes to next weekend. A huge change has shown up on the Euro between the 0z runs and 12z runs. The PNA is forecast to go strongly + meaning a ridge in the Pacific NW ie warmer temps. At the same time the western NAO is forecast to go negative, meaning blocking just off the NE coast of the USA. At the same time the AO is forecast to take a dive to the negative(if it stays + that means the cold air will be trapped in the polar vortex) meaning Arctic air will be released to travel down over the central US. If this holds up I would expect the 540 thickness line to reach the gulf coast. I hope this is bad run of the Euro and it will correct itself with the next run, if not look out. Novak your thouhgts? or The Hammer? I have three inches in White Bear Lake, and it appears that another band is coming in.. 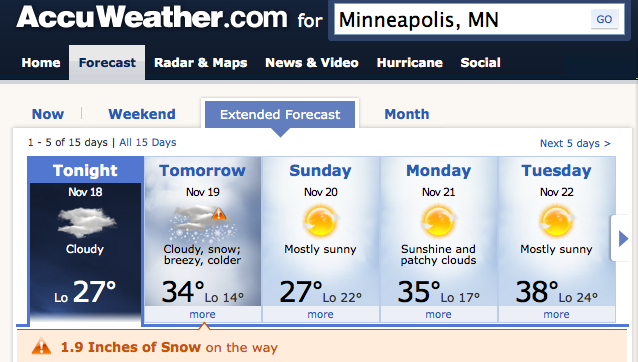 I am going to have to give the credit to in-accuweather this time around. They pretty much had things nailed down. Novak weather appears to have did well besides the fack that they did ont predict that 11" of snow. It does surprise me that the did get it right: it is a rare thing. Nobody in their right mind would have predicted nearly a foot of snow just NW of St. Cloud. In fact, I would argue that doing this would've been irresponsible because the margin for error (BUST) is too high. When looking at the snow facts, it appears that this storm was predicted quite well by most forecasters. In general, about 90% of the area (central/southern MN) received between 1"-4" of snow. It was only 5% to 10% of the area that got hammered. That heavy band of snow near St. Cloud was so thin that it would've been impossible to predict. Computer models simply are not refined enough to hone in on a solution like that. However, the models are getting better. I'm happy with how this storm evolved and feel good about how it was forecasted. As far as this Thanksgiving weekend is concerned, I'm betting on quite a change from Thursday to Saturday. Gut feeling is that we will transition from much above average temps, to below average temps within a 48 hour period. What happens in-between is still a question. Paul Huttner has a nice writeup here: http://minnesota.publicradio.org/collections/special/columns/updraft/archive/2011/11/seasons_1st_snow_brings_some_s.shtml. I guess it all depends on what forecaster you're counting and the time of the forecast (hours out, a day out, three days out, etc.). For my money -- and where I live close to the airport -- the snow was greater than expected and caused more trouble than I think people were lead to believe. As it relates to the NWS, a properly predicted storm would have included an advisory long before they came out with one. I have some thoughts I'll share in a write up later on. Bill, my frustration was with the lack of advisory too. Ultimately, my decision to go into the Cities yesterday was based on the fact that there WASNT an advisory and with the understanding that accumulations would be minor until mid-afternoon and major freeways would just stay wet. At 2:00, the Bloomington area had about 2 inches of snow and 494 was covered in icy slush(no plows in sight, and despite what MnDOT says, that road was NOT treated). Now, I know that weather is not exact, but so often they put out advisories for nothing. First accumulations of the year...seems to me, that should be an automatic advisory, regardless of the amount. Totally agree, AB. I read Paul Huttner in the morning who was leaning toward the coating to an inch and Paul Douglas, who had written in the morning (then blog always gets revised and "written over") that nothing was expected to stick until around dark at 5 p.m. I went to the Mall of America over lunch time and was very surprised at the road conditions. For all the storm talk, the key public awareness vehicle -- the weather advisory -- was not used until it was really too late. Just posted sort of a commentary/assessment... but not really a grading.